I had been using a Grohe Europlus II kitchen faucet for a number of years and the rubber spray control button had worn out. Actually, it probably had worn out at least a year ago, but I never got around to finding a replacement part. So, recently I stopped by the Grohe website to look up parts. The website included a contact form for writing in about warranty or replacement parts. So, I gave it a shot and received the replacement hand held spray a few days later under warranty. I was shocked. Utteryly shocked!! I didn’t have to call in and wait on hold for an hour. I didn’t have to mail the broken part back. It was too simple and convenient. I liked Grohe before, and I really like them that much better now. This is in stark contrast to the treatment I get from newspapers and ISPs. Kudos to Grohe for outstanding customer service. That’s good to know. I just emailed them also, same thing happened to my almost 2 yr. ladylux faucet. The button is getting sticky and seems to be degrading. Hope they send a new one…with an improved button! Update, they sent me a new handle assembly also. I got it within a week. No contact from Grohe, but they delivered the goods! After I attached the new faucet, I noticed that the water pressure was significantly better. When mineral deposits gradually build up over time, sometimes the drop in pressure is not noticeable until you switch to a new faucet. 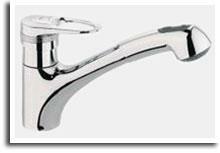 The same this is happening to my Alira model kitchen faucet. I thought I was going to have to spend $125 + to get a new one. You 2 have given me hope that they will stand behind this. I will keep informed. Just got an email from GROHE, they are sending a replacement under warrenty. Its nice to see a company actually standing behind what they sell! Hi, Wish me luck, I also just contacted about my ladylux button splitting. We’ve had several grohes including pot filler. I hope we have the same response you all have, we sure like the quality of their faucets.